^ 新加坡航空公司吳俊鵬先生. 星空聯盟. [2016年11月8日] （中文（繁體）‎）. ^ Boeing jetliner tries for record for longest nonstop flight. Seattle Post Intelligencer. 2005年11月9日 [2007年1月1日]. ^ Data/Airline Economics Channel. Air Transport World. 2007. （原始内容存档于2010-04-04）. ^ WATS Scheduled Passengers Carried. International Air Transport Association. 2005. （原始内容存档于2006-01-06）. ^ World’s Most Admired Companies 2007. 財星. 2007. ^ Airlines’ Reputations Hinge On the Basics, Study Shows (PDF). The Wall Street Journal. [2007年1月2日]. ^ Our achievements. Singapore Airlines. [2008年2月2日]. ^ Airbus wins $2.7B deal. Ottawa Citizen. （原始内容存档于2008-05-07）. ^ Telekom Malaysia and Malaysia Airlines Synergise Business Relationship. Telekom Malaysia Berhad. [2007-09-03]. （原始内容存档于2007-10-12）. ^ The Creation of Singapore Airlines. Singapore Airlines. [2007-07-01]. ^ Life. Asiaone. [2007-02-01]. （原始内容存档于2007-02-22）. ^ Past, Present & Moving Forward. Malaysia Airlines. [2007年2月1日]. （原始内容存档于2007年2月10日）. ^ The Creation of Singapore Airlines. Singapore Airlines. [2007年2月1日]. ^ 新航20年前曾提供协和机服务. 《新明日报》. 2000年7月27日 [2013年4月30日]. ^ SIA To Operate Special Farewell Flights To Commemorate B747 Retirement. Singapore Airlines. 2012年2月17日 [2013年5月30日]. ^ 23.0 23.1 图片 “感谢747”:新航运营特别航班纪念该机型退役. 民航资源网. 2012年2月17日. ^ 25.0 25.1 Poljak, Vesna. Australia rebuffs bid by Singapore Airlines. 国际先驱论坛报. 2006年2月21日 [2008年8月6日]. ^ Australia rebuffs bid by Singapore Airlines —. 国际先驱论坛报. 2009年3月29日 [2011年6月7日]. ^ Richardson, Michael. Growing Pains at Singapore Airlines: Carrier's Expansion Is Running Into Global and Regional Competition –. 国际先驱论坛报. 1991年11月23日 [2011年6月7日]. ^ Singapore Airlines Announces US$8.6 Billion Airbus A3XX* Order. 新加坡航空. 2000年9月29日. （原始内容存档于2008年5月7日）. ^ Airbus confirms super-jumbo delay. BBC News. 2005年6月1日. ^ Airbus Confirms Further A380 Delay and Launches Company Restructuring Plan. 空中客車. 2006年10月3日. （原始内容存档于2006年10月14日）. ^ First A380 Flight on 25-26 October. 新加坡航空. 2007年8月16日 [2007年8月16日]. （原始内容存档于2008年3月19日）. ^ Superjumbo in Sydney on maiden flight. Ninemsn. 2007年10月25日 [2007年10月25日]. （原始内容存档于2007年10月27日）. ^ 新加坡航空A380将执飞上海至新加坡航线. 新浪网. 2013年10月9日 [2013年10月9日]. ^ Chamberlin, Chris. Singapore Airlines to start Airbus A380 flights to Beijing. 澳洲商旅杂志. 2014-06-10 [2014-06-10]. ^ SIA to increase flights to Australia, Japan. Theedgesingapore.com. 18 December 2012 [20 January 2013]. （原始内容存档于2013年9月26日）. ^ SIA To Re-Start Non-Stop Singapore-US Flights With New A350 Variant. Singapore Airlines. 2012年10月13日 [2016年2月10日]. （原始内容存档于2015年10月20日）. ^ Singapore Airlines To Launch World's Longest Commercial Flights. Singapore Airlines. 2012年10月13日 [2018年5月30日]. ^ SIA To Launch Non-Stop Los Angeles Services And Increase Non-Stop San Francisco Frequency. Singapore Airlines. 2012年10月13日 [2018年7月11日]. ^ 'Capital Express' Service To Connect Singapore, Canberra And Wellington. 新加坡航空. 2012年1月20日 [2016年2月10日]. ^ 'SIA To Launch Melbourne-Wellington Services And Daily Flights To Canberra. 新加坡航空. 2018年1月24日 [2018年5月1日]. 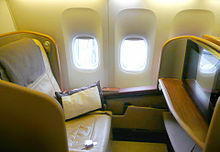 ^ Economy Class Cabin — Singapore Airlines. 新加坡航空. [2007年5月6日]. （原始内容存档于2009年7月9日）. 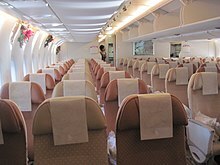 ^ Singapore Airlines to introduce Airbus A330 on Australian routes. PopSci.Com.Au. 2009年1月23日 [2009年1月23日]. ^ Loizos Heracleous, Jochen Wirtz and Nitin Pangarkar. Flying High in a Competitive Industry: Cost-effective Service Excellence at Singapore Airlines. McGraw-Hill. 2006: 217. ISBN 0071249648. ^ Heracleous, Loizos. Flying High in a Competitive Industry - Secrets of the World's Leading Airline. Singapore: McGraw-Hill. 2009: 256. ISBN 9780071281966. ^ The Creation of Singapore Airlines. Singapore Airlines. 2007. （原始内容存档于2009-07-09）. ^ Jan Dahinten. Singapore Girl faces makeover as airline looks to update image. The Scotsman. 2007年1月19日. ^ Karamjit Kaur. SIA will tender out coveted ad contract. The Straits Times. 2007年1月9日. ^ Jingle: Singapore: “Singapore Girl Theme” (1973) « Fly the Branded Skies. Fly the Branded Skies. [2014-02-24]. ^ 2013年6月19日. Singapore Airlines increase order for Airbus' A350 XWB from 50 to 70 | Airbus News & Events. Airbus.com. [2013-06-19]. ^ Singapore Airlines 777-200ER Refitted Seat map (PDF). Singaporeair.com. [2013-02-24]. ^ Your KrisFlyer Benefits at a Glance. [2007-04-22]. （原始内容存档于2009-07-08）. ^ The PPS Club. [2007-04-22]. （原始内容存档于2009-07-08）. ^ PPS Club Privileges at a Glance. [2007年4月22日]. （原始内容存档于2009年7月9日）. ^ About KrisFlyer Elite Silver – Singapore Airlines. [2007年4月22日]. （原始内容存档于2009年7月8日）. 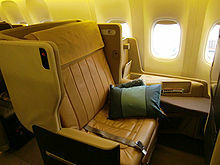 ^ About KrisFlyer Elite Gold – Singapore Airlines. [2007年4月25日]. （原始内容存档于2009年7月8日）. ^ 坐廉航都可以儲里數. U Blog （中文（香港）‎）. ^ Paulo, Derrick. Priority perks for fewer SIA flyers. Channel NewsAsia. 2007年3月13日 [2008年2月2日]. ^ MUCAviation. MISSED LANDING Singapore Airlines B777-312ER Munich Airport. YouTube. 2011-11-30 [2018-10-23].